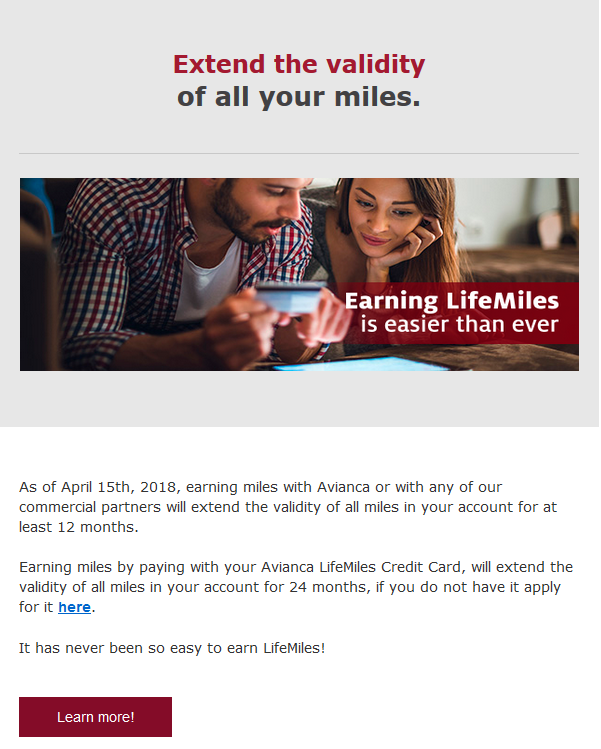 Avianca LifeMiles is, in my opinion, one of the least trustworthy award programs out there. Nominally affiliated with the Colombian airline Avianca, but actually a spun-off independent company like Air Canada did with Aeroplan (which is owned by a company called Aimia, and whose points are likely to become worthless in 2019), they offer regular mileage sales, only to devalue the miles almost immediately. Devaluations have sometimes happened with no advance notice. I never advise anyone to maintain large LifeMiles balances anyway. If you use this program, have a plan to burn the miles (which can be more difficult than you may expect due to IT issues, Starnet blocking and more – you’re in for a roller coaster ride). And if you have points, prepare for their validity to be shortened. Burn your LifeMiles now – in my view, you cannot trust this program. Pingback: Roundup: Articles From Around the Web!